For our session tomorrow, we have lots of exhibits. I am not sure that that is all that usable, but we will give it a try. First, here is the main presentation. Whoo is it that long? Yes, but there are lots of pictures, so it goes quickly. It includes material from both Michael Graber and Jason Verlangieri. Second, thanks to some current work that Jason Verlangieri did with LandSafe, we here are some special exhibits he prepared. Enough. Enough. More later, after the session tomorrow. His headlines almost prove the point (if you click on the headlines, it will take you to his posting on Fancy Formatting). The words are so jarring that we tend to look away, which is quite interesting, since you would think it would be the other way around. We really do ignore most things on websites–even ones that we use everyday, even one’s where we are supposed to do most of our work. 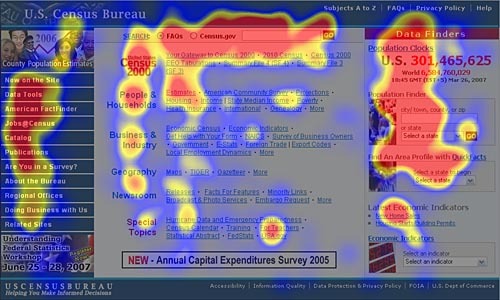 In his eye-tracking research of the census.gov website, Jakob Nielsen noticed several different search styles. Search dominant users. No nonsense here. The classic search dominant user looks around briefly, just on the off chance that something will strike them, but really, they go straight to search. He says that about 57% of the users in this test were search dominant users. I think people end up with this strategy out of frustration. They do not expect to be able to find things, so they go straight to search. Navigation dominant users. Navigation is like search, except that it centers on finding the right buttons or links to use. Because it is often not a very successful strategy (websites often do not provide good navigational tools), most people do not adopt this strategy. Successful users. Some users were successful users. They users manage to find the information provided on the site from the resource that the web designer intended. It is sometimes accidental. In the census.gov experience, these users were search dominant users who got lucky (which is how most people’s experience with many websites can be–they feel lucky if they find what they want). Do you recognize your style? What is it that website developers might do to make things easier for you? What are the frustrations you have trying to find things on the web? It all comes down to “usability”. We don’t use things that are hard to us, unless we have to. What else can we notice? Do you have a grocery “affinity club” card? It is even hard to know what to call them, you know, those cards you get from Krogers, Winn-Dixie, Ralphs, Safeway and so on? Do you carry the card (or one of this key ring mini versions?) How many is too many to carry? Or, do you just give them your phone number? How “usable” is it? Is there any of that “little awkward moment” at the check out line when you are trying to find your affinity club card and your credit card and watch your kids and… what else? Can you scan the card or does the “checker” need to do something? 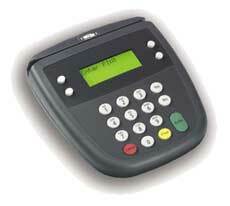 does your grocery store have one of those ATM/credit card readers where you “swipe” your card? when you look at it, do you know which way your card should go? do you have to look at your card to figure it out? Do you have one of those “keyless entry” cards or whatchacallits? Of course you do. Did you use one the last time you stayed in a hotel room? why do they make sense for hotel rooms? would you rather have a card key or a key? have you ever had one that did not work? What did you do? Why are gift cards a great invention? Why are they better than gift certificates? 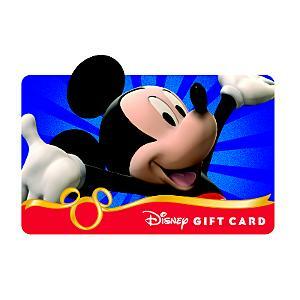 Why are gift cards a good example of “affordances and metaphors”? Do you have any confusion about how to use gift cards? After a brief trip to the Happiest Place on Earth, we’ll be back to “notice” some more. For this exercise, let’s take a real live example of a website, and see how “usable” it is. Go the the US Census Bureau website, http://www.census.gov/ and find out the population of the United States. Where did you find it? How long did it take? For an analysis of this website, visit Jakob Nielsen’s website (www.useit.com/) , and see how most people responded to this site, and how they did with that same question. Click here for “fancy formatting”. Interesting. It seems as if our best instincts may not be the right answer. What did Jakob Nielsen say the website should do? Do you agree? Let’s start with some resources. Last time, I invited everyone to start “noticing” how “usable” things are around them. Our first step had to do with telephones. Before we look at other areas around us, I thought it might be helpful to get some background on usability. While I highly recommend these, you can get a very good quick understanding of usability from these postings by Joel Spolsky (that he then converted into his book). At the end of each chapter, you will find a link to the next chapter. We will be using his axioms when we get together and talk about usability. I will let you read the article, but this is the best one to remember. As a “consumer” it is easy to spot, but as a “producer” we may not think about it enough. This is the problem with things that are supposed to be “obvious”. When I taught Kindergarten we had a book that was called: “It’s easy, if you know it”. Of course the point is, most things are not easy, even if people say they are. You have to know them for them to be easy. Which means you have to make them easy because things don’t come easy by themselves. Get into a rental car, its raining outside. Where is the control for the windshield wipers? You are at the grocery store. Which way does your credit card go into the machine? When I press the button that says print, will it just start printing, or will I get to choose the printer I want to use? Which should it be? These are all usability questions, and we know whether the person who designed the system make it so that it behaved just the way we expected the system to work. One last example, here’s Joel Spolsky’s experience with a box with software in it. See what you think. Our next topic is Usability. Usability. “I know it when I see it”. Okay, I know usability sounds like something fancy, but this is nothing more than paying attention to how things work. How things work can make things easier, or more difficult for those of us who use those things. And we really do know it when we see it. We see good and bad “usability” every day, and we notice. And we can be really frustrated by it. To get started, let’s start “noticing“. Let’s start with telephone calls. Next time, we talk about websites. I like talking about telephone calls because telephones do not have “back” buttons or “undo” buttons. If you inadvertently hang up on someone because you pressed the wrong button, there is no “undo” or “back”. That is why doing things with telephones makes everyone a little nervous. How do you rate the telephone manufacturers, the people who design the auto-attendant messages and menus, the voice mail designers and the rest when it comes to relieving our anxieties? Telephone calls. Pay attention to the telephone calls you make this next week. Would you rather talk to a live person or an “automated attendant”? How do you feel when you hear: “your call is important to us, please stay on the line for the next available operator”? If you do NOT know that extension of the person with whom you want to speak, how easy is it to find out and be connected? If there is a “directory” how many letters do you have to figure out how to punch into your telephone in order to identify the party? Do you get discouraged when the person has a long name? Now, how do they spell their name? Do you get lost entering the letters (that are really numbers) into your phone? How easy do they make it to find someone? What do you do when none of the choices (“Listen carefully as our menu choices have changed” –does that send chills down your spine or what?) do not fit what you want to do? If the message says that this call may be monitored or recorded but you do not want to be monitored or recorded, what do you do? Can you do anything? Do you have to give up your right of privacy to talk to people? How often do you find yourself hanging up before you got what you wanted? Let’s say you are on the telephone and another call comes in. Do you know how to switch from the first call to the second? What happens to the first call? Are they on hold, or did you just hang up on them? Is there anything on the telephone that tells you what to do, or tells you what is happening? Okay, Alex, let’s take telephone calls for 200. Let’s say you are on the phone leaving a voice mail message, and you receive another call, now what do you do? If you switch from the first call to the next, what happens to the voice mail? Can you ever come back? Do you have trouble entering all the numbers? Reading all the numbers? Do the instructions they give you make sense? Do they make you wait in order to be “placed into conference”? Is the new conference call service different from the last conference call system? which one is more “usable”? As I said, usability: I know it when I see it. So why it is that people who design systems (that includes you and me) don’t always see it? Oops, I think that is my phone ringing. Gotta go. Click on the link above for the whole story. What do you think? Would this work at FNC? Early in its life, FNC did not track vacations. Why do you think it changed that policy? In California, vacation is considered compensation, so that if you have 5 days vacation available to you and you leave to take a sabbatical in Kenya, you are entitled to be paid those days. It sorta works like a savings account you did not know you had. Would you be concerned that people would take “too much vacation”? At inconvenient times? Is the trade off that you never feel that you are on vacation, just “staying in touch”? But don’t we need to be sure that we have enough people in place to do certain tasks every day? How do we handle that? Do you agree with the quote below? Keeping track of things is never free. It cost to track vacations, sick days, or for that matter the cost of pencils. What do you think, can it actually save you money to stop worrying about some things? Go ahead. Quiz yourself, and feel free to provide your comments. Either way, this is a good start for the Labor Day. So have a happy and safe Labor Day Weekend. Po-TAY-toh, Po-TAW-toh, To-MAY-toh, To-MAW-toh, let’s call the whole thing off. (With thanks to George and Ira Gershwin). Well, not really. We are taking our second summer hiatus from our monthly meetings of the FNC Roundtable, to resume in September. For those who have been glued to this blog and the calendar, yes that means the August 15 meeting is cancelled. We learned lots of things in our meeting on meetings, but I think the easiest way to really take advantage of what we talked about is to follow our “get out of jail free” steps. Start using them today. Remember that a meeting is what happens when any two people or more get together, whether in the hall, on the phone or around a big table with lots of hand outs. So, we are meeting every day, and can take advantage of these Get Out of Jail Free steps every day. I bet you are still not doing this. Are you waiting for people? Do you have to wait for the “really important people”?–what about the rest of us, are we chopped liver, as they say? Remember the “There are no stupid ideas” rule. That is an absolute must– as we learned in our negotiations class. What happens when you get off the agenda? Repeat after me: THE URGENT ALWAYS TRUMPS THE IMPORTANT. Remember what the parking lot is. That is where we park great ideas, or issues or problems so that they do not knock us off course, but we also do not forget them. If you do not do this, what happens? Holy smoke, you want us to start AND end on time? Will people be grateful if you finish on time? If we can reduce the “I hate meetings” down to “I sorta hate meetings” or “I hate other meetings but not this one”, that is really good. The point of this is that WE CAN CHANGE IF WE DECIDE TO. This keeps order and keeps things moving. And, here is the last minute rush of “interesting articles”. Don’t want everyone to be overwhelmed, but you might find these pieces interesting (you knew at some point I was going to start bringing out the really serious stuff). Each of these is from the Harvard Business Review and explore different aspects of meetings from “how-to” to “how not to”. All of them are short enough to get the point quickly (except the first one, which needs to cover lots of ground, but still gets to the point. This one is very thorough and covers practically every topic that relates to meetings and their success. A good one to start with. This is focused on the “meeting with your boss to approve your proposal” meeting. The key word here is “FOCUS”. You will like this one. You will want to use this the next time you have an idea or project. Another good quote: “It simply left no fingerprints on the business”. Is that a great line or what? In other words, if you are going to the trouble of having an off site, you will want to be sure that it will have a real and persistent influence. Will pick up on each of these on Thursday.